CGE has locations spread across three primary regions—North America, Europe, and Southeast Asia—with its primary headquarters located in Houston. Sub regions exist within each region, each with its own Citrix infrastructure. 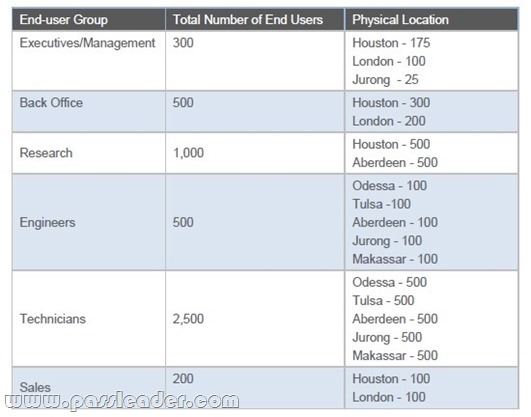 Once power and cooling upgrades are complee, Houston will be the primary datacenter and London will be the secondary datacenter. The following diagram details the locations and network connection types. The majority of end users connect using CGE-owned HP laptop and desktop devices. Over 90 percent of these devices are Windows 7-based, as CGE is in the process of completing a Windows XP to Windows 7 migration. CGE has standardized all these devices on Citrix Online Plug-in for Windows12.1, and is in the process of testing Receiver for Windows 4.2. In the past, some end users have complained about slowness when typing, which may indicate issues with latency. CGE also allows end users to connect using non-corporate-owned devices. Many end users connect from personal computers and mobile devices such as Apple iPads and iPhones. End users are instructed to download Citrix Receiver from either the Citrix website or the Android or Apple app stores. The engineers, technicians, and research groups access Citrix applications primarily in an office-type environment, but may need to access these applications while in the gas and oil fields. In these scenarios, end users connect to Citrix using local Internet connections, ranging from a wireless access point to a tethered mobile device. To prevent printer driver issues and sprawl, CGE tries to limit end users to their default printer when accessing Citrix. The IT department at CGE’s headquarters has mandated that only the Citrix Universal Print Driver be utilized. As each region manages its own Citrix infrastructure, this has been difficult to enforce. Each end user’s home directory is mapped when accessing a Citrix session; the drive-mapping letter varies based on the end user’s region. End-user data is stored on different network device types and shares ranging from a Windows CIFS share to an NAS appliance. Corporate IT is unsure if end-user data is being backed up in all regions. CGE hopes to implement formal, corporate-wide standards in the new Citrix environment. A Citrix Architect reviewed CGE’s antivirus policy and found that it does NOT comply with the posted Citrix antivirus recommendations. What should the architect recommend be added to CGE’s antivirus policy? CGE’s security officer states that, for compliance reasons, all network traffic between Delivery Controllers, StoreFront servers, and NetScalers must be encrypted. Which type of encryption should a Citrix Architect recommend? CGE’s security officer states that, for compliance reasons, all network traffic between Delivery Controllers, StoreFront servers, and NetScalers must be encrypted. How should the architect recommend that SecureICA be implemented? CGE’s security officer states that, for compliance reasons, all network traffic between Delivery Controllers, StoreFront servers, and NetScalers must be encrypted. How should the architect recommend that IPsec be implemented? CGE’s security officer states that, for compliance reasons, all network traffic between Delivery Controllers, StoreFront servers, and NetScalers must be encrypted. How should the architect recommend that SSL be implemented? CGE’s security officer states that, for compliance reasons, all network traffic between Delivery Controllers, StoreFront servers, and NetScalers must be encrypted. How should the architect recommend that L2TP be implemented? Answer: Visit http://www.passleader.com/1y0-401.html To Get The Newest 1Y0-401 Dumps In PDF And VCE. CGE’s security officer states that, for compliance reasons, all network traffic between Delivery Controllers, StoreFront servers, and NetScalers must be encrypted. Why does using SecureICA meet CGE’s compliance requirements? CGE’s security officer states that, for compliance reasons, all network traffic between Delivery Controllers, StoreFront servers, and NetScalers must be encrypted. Why does using IPsec meet CGE’s compliance requirements? CGE’s security officer states that, for compliance reasons, all network traffic between Delivery Controllers, StoreFront servers, and NetScalers must be encrypted. Why does using SSL meet CGE’s compliance requirements? A Citrix Architect is asked to design a new external access architecture for CGE. The regional datacenters have NetScaler appliances delivering load-balancing services. Security policy mandates that these internal appliances CANNOT connect to the DMZ. Which configuration should the architect recommend for the new external access architecture? Download the newest PassLeader 1Y0-401 dumps from passleader.com now! 100% Pass Guarantee!